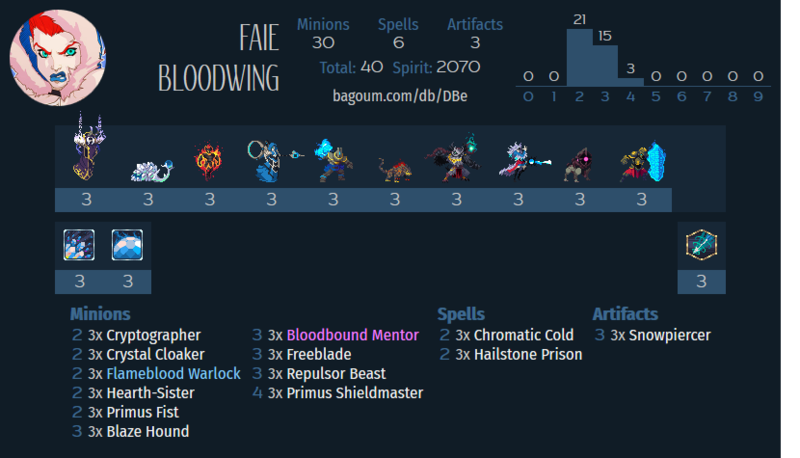 Faie’s Bloodbound spell gives you some constant and guaranteed burn damage, alongside some BBS enablers supported by some of the better neutral aggro options Faie makes for a great aggro deck for a low cost. You can run without dropping the spirit into the Bloodbound Mentors and still have a fine deck, but I feel like they do bring the power level of the deck to that next step up by enabling a backline threat that can close out a game by doubling your BBS damage per turn or build up some in hand burst particularly if you get off cryptographer also. Get up in their face hard and fast. You’re not looking to a long game, even if with Mentor’s you sometimes get to win those, the deck is best in the early game and should look to pile the pressure on early. Start with your best statted minions while using cheap spot removal when necessary. keep track of how much damage you think you have given your current hand and work towards lowering their life total more and more to match your in hand damage. Sometimes you may be forced to back off and spam Warbird, which can be a winning strategy, but might not be the ideal one. Faie’s BBS is a very efficient mana for damage trade, and hits the enemy anywhere on the board, with the upside of sometimes hitting other minions or forcing their positioning. So getting more of a good thing is good. Mentor is great, with fine stats for a 3 drop and backline value generation ability. Mostly you like to save up the warbirds since as I said they are good damage for the mana cost, but it also gives the flexibility to be replaced if you need the pseudo card draw and to look for other options. Crypographer is good enough onit’s own providing a passable body on top of some extra burn damage, but does also combine with Mentor to trigger it again and get extra value from it, which is quite nice indeed. You can sort of build your own spiral technique with this pairing. Hearth Sister is pretty much a Vanar staple due to how useful it can be to move any minion to a position of your choosing. This enables minions to reach places they otherwise couldn’t, brings backline enemies into the fray to be killed and usefully with Faie let’s you position enemies into Warbird. Just a super useful card once you’ve learned to use it. Repulsor is sort of like a weaker version, with some of the same benefits, but does have some upside on the end position of the enemy as you don’t have to bring it to a spot that you are able to deploy to, so can be better to shunt big threats into a corner or such. We’ve added some single target spot removal to cheaply answer some threats and still have enough mana to develop our board more or to push more damage into the enemy. Hailstone Prison tneds to be more useful for answering large costly minions that have good statlines, while Chromatic Cold is better to answer backline type minions with powerful rules text, it can also squeeze in an extra damage in a lethal scenario. 5 Attack is quite a lot, if you hit them with this it’s 20% of their HP gone in one chunk, with the possibility to do more if they don’t remove the artifact or otherwise prevent you from attacking again. Even if you end up clearing a few minions with the remaining charges it can clear up the board for the rest of your wee goobers to go in and claw the enemy general. At 3 mana you can often get this equipped early or alongside a removal or other small minion to put pressure on from multiple angles. And it lets you feel confident in moving forward toward the enemy. It can also do some work in forcing them back, which may let you also step back to begin pelting them with warbirds if you are confident in that plan. Our remaining 2 drops, we actually have quite a lot to keep the curve very low and allow us to deploy multiple threats or answers per turn. Cloaker is probably best early, particularly as player 1 where you can easily threaten to infiltrate it. a 4/3 for 2 is a good deal and can potentially get 8 damage on the enemy general. Flameblood is a fragile unit, you can deploy it at any time in the game that you feel it makes sense to, but it is fairly likely to die, but adds a reasonable amount to the out of hand burst you can build up to end a game with. Primus Fist is the more middle of the road between the 2, has some burst value, but also some value on board and it’s a card I’ve talked about in a lot of other budget write ups since it is so useful as a common 2 drop that you’re happy enough to have in hand at most points during a game. I think I may have also discussed this one before, but it’s a good body that even though it has the drawback of adding cards to the enemy hand it is a not an exact symmetrical effect as the aggressor should be able to use the card better. With the deck having such a low curve it should be able to make quick use of the card. It doesn’t matter if you have no cards remaining and the enemy has full if they are on 0HP after all. Freeblade is decent body that will cause some disruption in your opponents plan as they have to figure out what the best course of actions is were it to be each different sentinel. Won’t rock your world most of the time but is a decent card that can get in multiple hits usually too. Shieldmaster also falls into the categorization, I mentioned this in some of my Lyonar write ups, but it’s worth again saying that while provoke looks like (and is) a good defensive tool it can be equally useful on the offense to prevent the opponent running away, body blocking and having safe spots to play their midline or backline minions. Spelljammer is really the only craft that this deck needs to be what could be said to be a final version, but Alcuin Loremaster with Concealing Shroud is a funny option also. Glacial Fissure is something that can be a bit cheesy but isn’t a terrible payoff. There’s some optional way to branch out of the balls to the walls aggro style, but that’s may be a different deck by then, and I won’t cover it all here.